Almost 2,600 riders a day are using the new Angle Lake Station, where park-and-ride spots are nearly filled. Commuters have been flocking to Sound Transit’s new Angle Lake Station, which is already near its 2018 ridership target, since the grand opening in September. The first counts from there show that an average 2,578 passengers walked onto light-rail trains toward the airport and Seattle, during midweek samplings in October and November. And the station’s 1,120 park-and-ride spaces are 93 percent occupied, spokeswoman Kimberly Reason said. These numbers are very close to the goal of 2,700 weekday boardings, or 5,400 total users, if people returning home are counted. 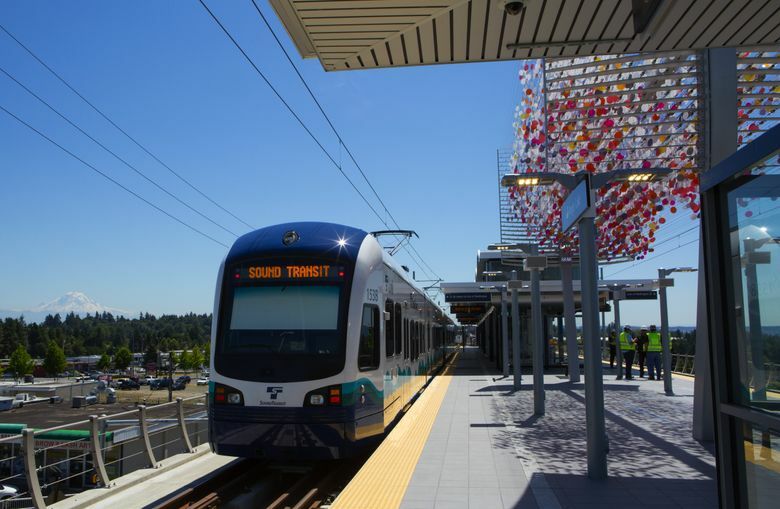 Demand for the Tukwila International Boulevard Station, three miles away, remained the same, at 2,747 weekday boardings. That suggests Angle Lake is serving mainly new customers, rather than draining commuters from Tukwila and its chronically full 650-stall parking lots. In addition to Seattle commuters, Angle Lake Station attracts airport employees who show up in a bus or car, and finish their commutes by train. To boost ridership, and give taxpayers a full return on the $343 million, 1.6-mile rail extension, Sound Transit needs more people to arrive by buses, taxi drop-offs, bicycles and walking. But transit-friendly growth also brings displacement. Sixty families are facing possible eviction from The Firs mobile home park nearby, where another hotel is planned for the Highway 99 strip.